The above mailer makes the highly dubious claim that Del. 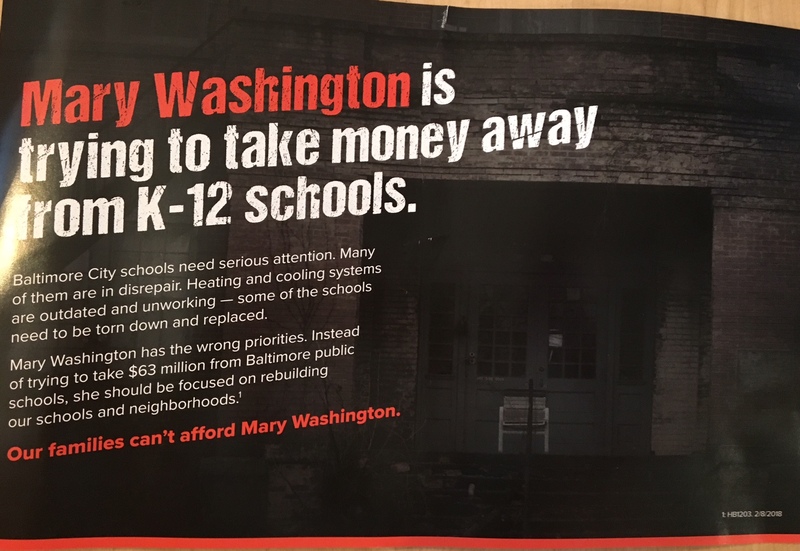 Mary Washington, a candidate for the Maryland Senate, tried to take away $63M from K-12 school kids, and cites HB 1203 as evidence. HB 1203, the Maryland Education Opportunity Act of 2018, was the House bill to provide free college tuition for Maryland residents who enroll at a community college as a candidate for a vocational certificate or an associate’s degree within two years after graduating from a high school in the State or successfully completing a GED. The fiscal note on the bill states that the initiative is likely to cost at least $63.4 M per year, and that the funding used to reimburse a community college for foregone tuition revenue will be paid from gaming proceeds diverted to the Education Trust Fund. The mailer makes the leap that since K-12 education is also paid from the Fund that Mary wants to take away $63M from K-12 schools. 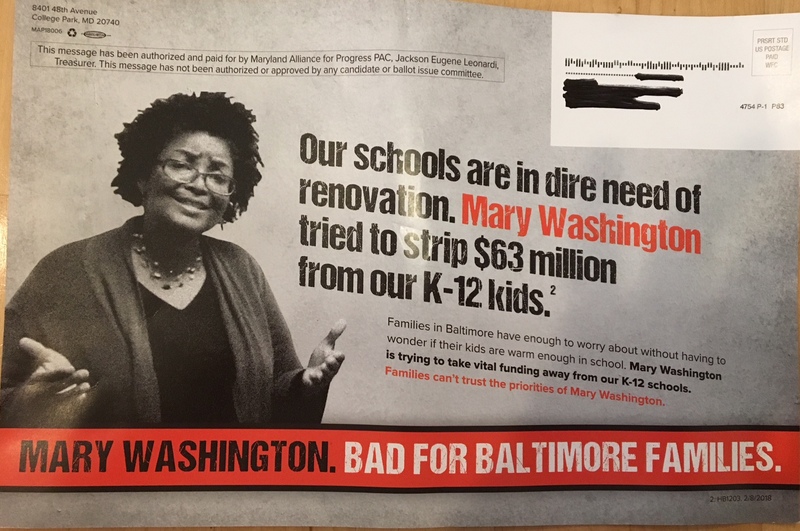 The Maryland Alliance for Progress PAC paid for the mailer. 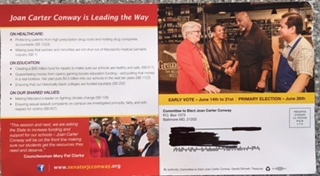 Other than aiding Washington’s opponent, incumbent Sen. Joan Carter Conway, nearly every contribution made by this PAC has been in direct support of former Laurel Mayor Craig Moe, current candidate for PG County Council. The PAC has received donations from entities like KHM Limited Partnership LLC, Thrift Manor LLC, Lanham LLLP, GKG Partnership, and HMH Partnership. Del. 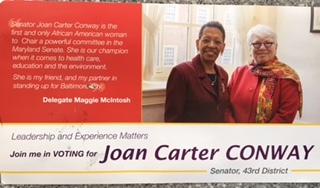 Maggie McIntosh, Chair of the Appropriations Committee and the most influential member of the House of Delegates after Speaker Mike Busch, is all in for incumbent Sen. Joan Carter Conway’s effort to secure a sixth full term. Both represent District 43 in Baltimore City, where Conway faces a strong challenge from two-term Del. Mary Washington. Washington is running hard, heavily emphasizing her efforts to protect residents from losing their homes over water bills, and represents the strongest challenge Conway has faced. However, Conway has won reelection despite past scandals and has a large war chest. The emphatic public backing of McIntosh surely will also help her campaign. While Conway mused publicly about retirement, she now is in it to win it. The one downside for McIntosh, even if Conway wins, is that younger members of the House are increasingly restive regarding opportunities for advancement–notwithstanding the deserved promotion of Del. Anne Kaiser to head of Ways and Means. Protecting Conway reinforces that perception. On the other hand, it confirms McIntosh’s reputation as a loyal ally. Today, we continue our look at the upcoming Democratic primary challenge by Del. 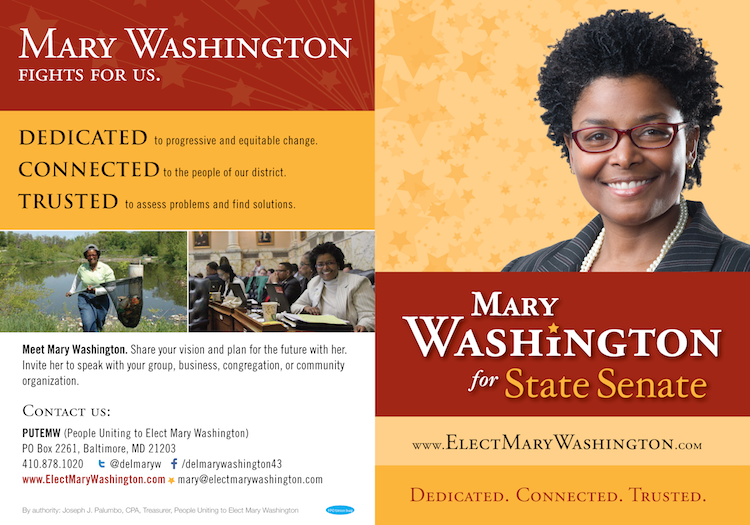 Mary Washington to incumbent Sen. Joan Carter Conway (D-43). Del. Mary Washington brings a record of serious work on issues and constituency service to her challenge to incumbent Sen. Joan Carter Conway. She has been keenly interested in expanding community schools that help link students and their families with services that can help in times of crisis or to overcome barriers to gaining an education. Washington has also gained attention for her effort to prevent homes for being sold for unpaid water bills—a real problem in Baltimore City because of spiking rates and major glitches in the new water billing system that have led to over 1000 homes and churches facing the threat of sale. These are serious problems for people on fixed incomes. Washington is poised to make a more serious bid to challenge Conway than Henry’s unsuccessful effort in 2014. First, Washington will have already represented the exact same constituents as Conway for eight years. Additionally, she ran a strong campaign for the House twelve years ago, so she’s well-known in the district and on the ballot. Second, Washington is much more strongly positioned form a financial perspective. Her last report revealed that she had $81,572.45 in her campaign account. While less than Conway has, or will be able to bring to bear in a tough primary, Washington already has enough to afford key expenditures for a serious challenge. On the other hand, the two sitting delegates, Maggie McIntosh and Curt Anderson, have made clear that they will stick with Conway. Like Sen. Mike Miller, who will also back Conway, Del. McIntosh is an experienced, skilled politician who can bring significant dollars to bear and plays for keeps. They’re key backers that Conway needs—and has—and not the sort of opponents anyone wants to face. If Conway decides to retire, Anderson has indicated that he is inclined to enter the race, though the betting appears to be that Washington would defeat him. It will be interesting to seek how tight a joint effort the other incumbents run and if Washington aligns with other challengers. Washington’s challenge appears to be having the effect of causing Sen. Conway to dig in her heels and want to run for a sixth term. While Conway is a seasoned incumbent who has won her spurs in tough races, it remains unclear how aggressively she could or would campaign. In contrast, Washington is clearly hungry for the seat. This will be a great race to watch. Sen. Joan Carter Conway (D-43) has not made her intentions clear regarding running for reelection but that has not stopped Del. Mary Washington (D-43) from throwing down the gauntlet and declaring her intention to run for the seat. After winning election to the Baltimore City Council in 1995, Conway was appointed to the Senate in 1997 when Sen. John Pica, Jr. retired. Since then, she has won the Democratic nomination—tantamount to election in this district—five times. While Conway has faced stronger challenges in recent years, she has continued to win convincingly. 2014: Conway, 64.5%, Councilman Bill Henry (D-4), 35.5%. In 2014, Conway dispatched Councilman Bill Henry with ease, winning by a margin of 29%. Henry’s expenditure of $45,687.36, while not insubstantial, was below the threshold needed to take on an entrenched incumbent. Challengers don’t need to outspend incumbents but they do need enough for key expenditures. Conway spent $146,993.41 in 2014 and this does not include any independent expenditures made on her behalf, though it does include some expenses for the general election. Though she once again contemplating retirement, having packed up her Senate office, Conway remains financially prepared to wage a serious reelection battle with $108,567.58 in her campaign account according to her January report from this year. Conway has an interesting relationship with Senate President Mike Miller. While they don’t get along personally, Conway has long been part of Miller’s leadership team as Chair of the Education, Health and Environmental Affairs Committee. After the primary in 2014, Conway transferred $35,000 from her campaign account to Miller’s Democratic Senatorial Committee Slate and another $5,000 to conservative Sen. Roy Dyson (D-29). In short, there has been little friction on legislative or political matters even if Miller and Conway will never be BFFs. Tomorrow, we take a closer look at the challenger, Del. Mary Washington. District 43 is the first African-American-majority district (63% black) in this series previewing the upcoming 2014 elections. 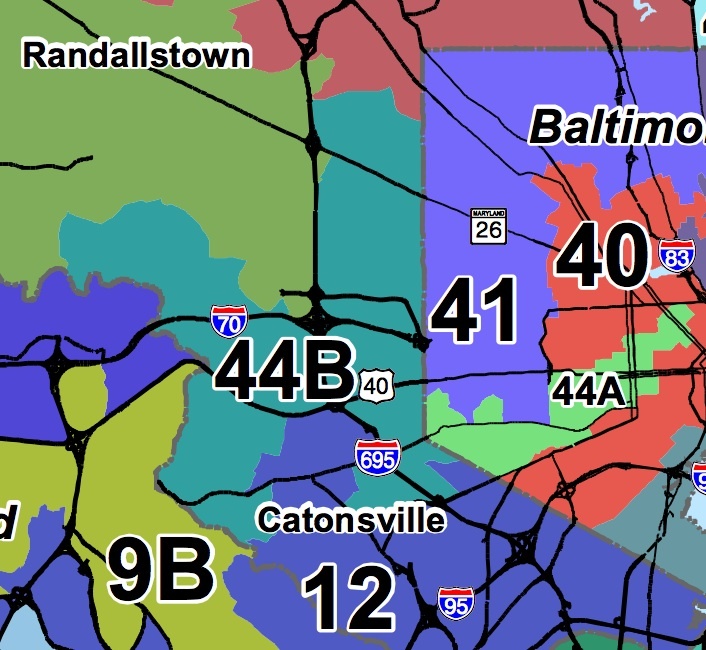 Like District 46, District 43 survived redistricting with relatively little change despite the need to reconfigure Baltimore City’s districts due to its usual decennial loss of representation. 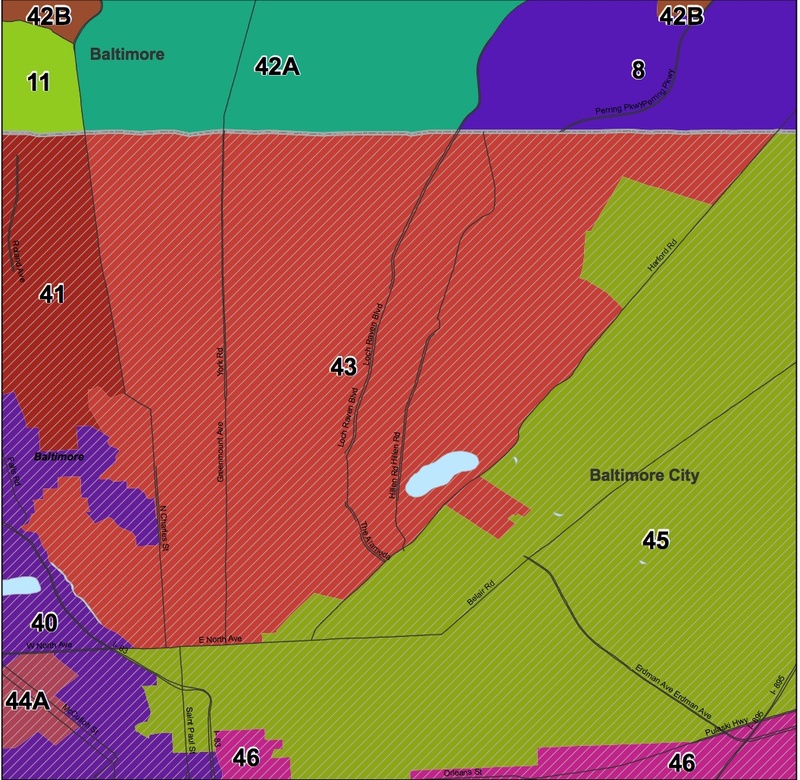 District 43 remains roughly the same area between N. Charles and Harford Rd. Sen. Joan Carter Conway served on the City Council for two years before being appointed to the Senate in 1997, when incumbent Sen. John Pica chose to retire. In 2010, Conway easily turned back challenger Hector Torres who ran to her left and won 30% of the primary vote. This year, she faces a challenge from Baltimore City Councilman Bill Henry (D 4). Sen. Conway along with slate mate Del. Maggie McIntosh have supported Henry’s opponents in his previous City Council races, so alliances are already drawn. Councilman Henry was an early, vocal, and valuable ally for marriage equality who testified repeatedly for the bill. Sen. Conway came to support it later in 2011, but she stuck firmly with the pro side in votes on the issue from that point onward. Probably more salient for the election in terms of issues is a likely clash over liquor regulation–an issue cited by Henry is his announcement. Conway’s late husband was a city liquor board inspector. Her past opposition to allowing Marylanders to have wine shipped to their homes is indicative of her close ties to the liquor lobby. However, the video did not substantiate his case well, at least to this viewer. Sen. Conway and two other people were walking away from the camera when he followed them. At one point, Conway appears to put her hand on the camera lens but it’s not clear from the video that she did anything to the camera. In another moment, you can see Conway trying to dissuade her companion from escalating the argument. You watch and draw your own conclusions. Regardless of a bout of negative media attention and though he would otherwise be a promising challenger and senator, Henry’s lack of campaign funds severely hinders his campaign. He has only $8K in his campaign account compared to Conway’s $106K–a nice amount in a district where “walking around” money is said to remain a valuable resource. And Conway will have the strong support of all three incumbent delegates who will form a united slate for reelection. The elections for delegate are quiet. Incumbents Del. Curt Anderson, Maggie McIntosh, and Mary Washington are all seeking reelection. Their one filed opponent, Timothy Vance, has not filed a campaign report. He describes himself on Facebook as a “regular citizen of Baltimore” and will remain so after the election. Del. 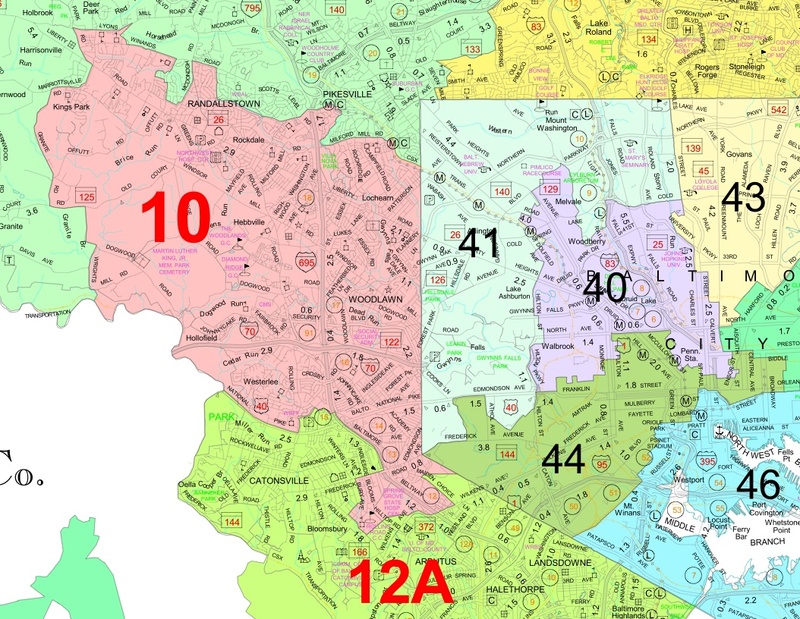 McIntosh is the senior pol in this district. She was first elected to the House in 1992 and served as U.S. Sen. Barbara Mikulski’s campaign manager and state director in the previous four years. A former House Majority Leader, she has chaired the Environmental Matters Committee since 2003 and is close to Speaker Michael Busch. McIntosh is seen as one of the most likely–possibly the most likely–to succeed him but many less senior delegates are also restless after ten years of a largely unchanged leadership. Del. Anderson served in the House from 1983-95. In 1994, he ran for the Maryland Senate but lost with 44% to incumbent Pica. Anderson rejoined the House in 2003. Del. Washington first ran for the House in 2006. Though she lost, she came in a respectable fourth in the primary and easily won the nomination for the open seat in 2010 on a slate with the other incumbents. While McIntosh has $77K in her campaign account, her colleagues have little–just $5K for Anderson and less than $1K for Washington. But Vance did not even file a report and has no record of even having a campaign account. No Republicans have filed for any of the legislative seats. UPDATE: I mistook Mary Washington’s account for that of another candidate. Del. Washington has $50K cash on hand, which renders her a well-funded candidate.